The Presonus Audiobox i Two is a complete hardware/software Recording Bundle. 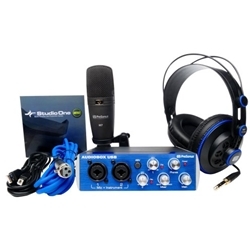 Just add a Mac, PC, or I Pad..
Start recording right-out-of-the-iBox with this complete, all-PreSonus package! Record with the ultra-mobile AudioBox iTwo bus-powered, 2-channel, USB/iPad audio/MIDI interface for Mac, Windows and iPad; award-winning Studio One Artist DAW software for Mac and Windows; and easy-to-use Capture Duo recording software for iPad. Transfer songs wirelessly direct to Studio One or wired via Itunes between iPad and Mac or PC. Capture sound with the M7 large-diaphragm condenser mic and monitor with high-definition HD7 headphones.